Henry Saiz takes a slow 15 minute introduction on the first disc, then leads you down a progressive path with dew drops, subtle symbol slashing crashes, and melodic rumbling bass. The break at 17 minutes is a remarkable space aged voyage into a chugging delightful journey. Right now techno meets progressive and Henry Saiz is a master at getting the symbiotic continuity in order to convey a massive and well thought spiritual awakening within cutting edge electronic music. I own a few of his tracks and have always noticed his attention to layered detail while drawing emotion from his listeners. The warmth, motion, and magnetism in the latest installment of the Balance series by Henry Saiz breaths a refreshing breath of electronic oxygen as Henry maintains the gauges for a comfortable deep sea dive. Bouncing through different dimensions as he does tracks, his mixing is proven to have fluidity. Some funk comes our way half way through the first disc. At this point the bpm’s are just a touch too slow for my personal liking but to each their own. Some bigger tunes approach which are a bit dreamy and more towards the proggy vibe which does cater to some specific masses. Balance 19’s first disc has not delivered as I would have imagined. Some off kilter disassociated large bass filled echoed sounds come through with potential. After the drop at 55:33 the set takes hold with a more chunky number that pushes heat towards the floor. A supreme vibey melodic track with snap snares and a kind of optimistic moodiness. With the addition of some throwback diva vocals the breakdown perpetuates for a moment and by the drop we are lured back into a beautifully structured thumping bass. The lines of solid foundations, acid like tweaks, and a darkness with light finds me immersed by the sound. The end of disc one is another mega layered slower tech track that takes the wind out of the dancing sails but has a nice touch for a cool down. Disc 2 started off with several retro and futuristic elements that define an evolution within progressive style techno-house and Henry Saiz has the ability to play sounds that are captivating. 40 minutes into disc 2 proves that “prog” is here to stay and Henry is on the forefront of a spectacle of ecstatic musical elements that push the margin while staying innovative, creative, and intuitive. 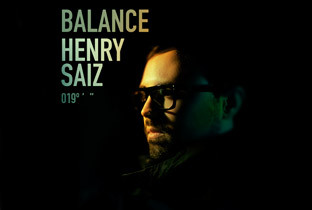 Knowledge, insight and personal experiences are reasons why DJ’s and producers are able to continue to come up with impressive beats and Balance 19 by Henry Saiz is living proof that if you have a dream to share in the electronic dance scene, then you should share it. That is just what he has done. I might not “love” every track but it’s the ones that I do that make me want to listen to Balance 19 again and again. Recommended for fans of progressive techno.